Raumfahrt+Astronomie-Blog von CENAP - Blog: Raumfahrt - Wo ist Mars-Rover Curiosity ? WASHINGTON -- NASA has narrowed the target for its most advanced Mars rover, Curiosity, which will land on the Red Planet in August. The car-sized rover will arrive closer to its ultimate destination for science operations, but also closer to the foot of a mountain slope that poses a landing hazard. "We're trimming the distance we'll have to drive after landing by almost half," said Pete Theisinger, Mars Science Laboratory (MSL) project manager at NASA's Jet Propulsion Laboratory (JPL) in Pasadena, Calif. "That could get us to the mountain months earlier." 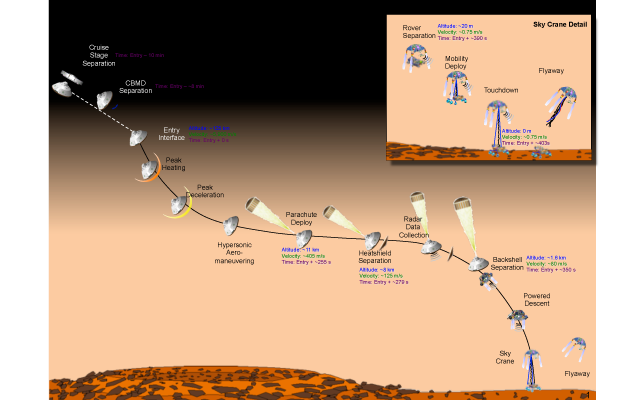 It was possible to adjust landing plans because of increased confidence in precision landing technology aboard the MSL spacecraft, which is carrying the rover. That spacecraft can aim closer without hitting Mount Sharp at the center of Gale crater. Rock layers located in the mountain are the prime location for research with the rover. 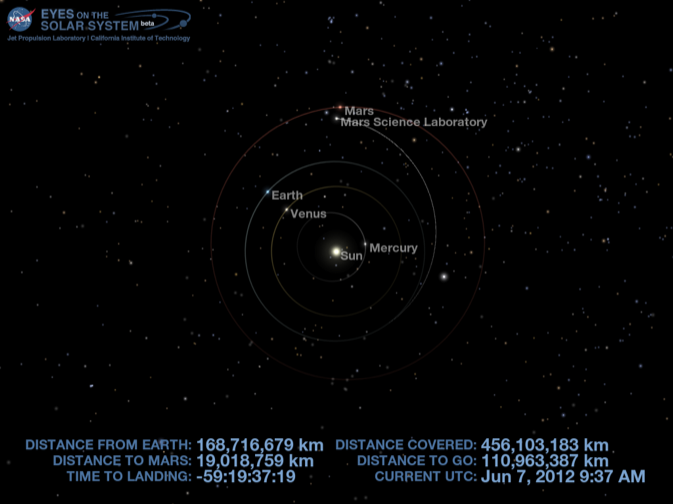 Curiosity is scheduled to land at approximately 10:31 p.m. PDT Aug. 5 (1:31 a.m. EDT, Aug. 6). Following checkout operations, Curiosity will begin a 2-year study of whether the landing vicinity ever offered an environment favorable for microbial life. Theisinger and other mission leaders described the target adjustment during a June 11 update to reporters Monday about preparations for landing and for operating Curiosity on Mars. The landing target ellipse had been an ellipse approximately 12 miles wide and 16 miles long (20 kilometers by 25 kilometers). Continuing analysis of the new landing system's capabilities has allowed mission planners to shrink the area to approximately 4 miles wide and 12 miles long (7 kilometers by 20 kilometers), assuming winds and other atmospheric conditions as predicted. Since the spacecraft was launched in November 2011, engineers have continued testing and improving its landing software. MSL will use an upgraded version of flight software installed on its computers during the past two weeks. Additional upgrades for Mars surface operations will be sent to the rover about a week after landing. "The material from the drill could complicate, but will not prevent analysis of carbon content in rocks by one of the rover's 10 instruments. There are workarounds," said John Grotzinger, MSL project scientist at the California Institute of Technology in Pasadena. "Organic carbon compounds in an environment are one prerequisite for life. We know meteorites deliver non-biological organic carbon to Mars, but not whether it persists near the surface. We will be checking for that and for other chemical and mineral clues about habitability." 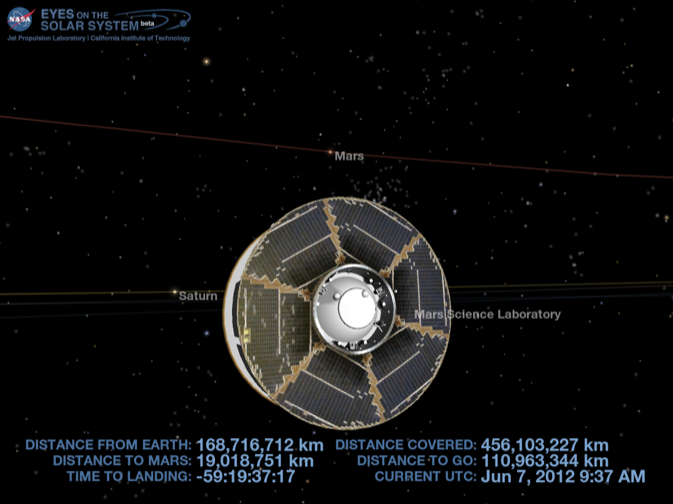 Curiosity will be in good company as it nears landing. Two NASA Mars orbiters along with a European Space Agency orbiter will be in position to listen to radio transmissions as MSL descends through Mars' atmosphere. The mission is managed by JPL for NASA's Science Mission Directorate in Washington. Curiosity was designed, developed and assembled at JPL.